On paper, PAVA, the Pacific American Volunteer Association, is a seemingly typical volunteer association. However, if you look deeper, it is clear that the club makes practical and favorable impacts on people’s lives. In addition, the organization fosters a sense of camaraderie between volunteer students and members of the community. PAVA focuses on empowering the environment and the community, especially areas that are neglected or are in need of help. Acting as a volunteer association as well as an Environmental NGO (non-government organization), its scope is broad. 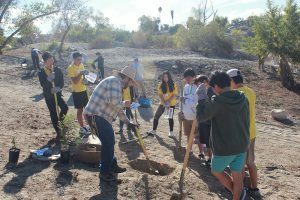 Assisted by the student volunteer force, the organization spreads awareness of detrimental environmental habits. For example, Midnight Mission holds weekly events to prepare food for hungry, homeless people living on the streets of San Pedro. The event is centered around the kitchen, preparing ingredients that will be used in dishes for the homeless. Some employees are former prisoners who have decided to give back to their communities. The atmosphere can be quite stiff at first, but such awkwardness perishes and the experience of seeing dozens of homeless people enjoying the food becomes a very uplifting one. “The first midnight mission I went to, before I even stepped into the building, I was terrified. It was so early in the morning, too. But when people started coming in and taking the food, they were friendly. They smiled and said thank you. It was heartwarming to be able to experience that.” Ashley Noh (10) recalled. Working in the community is particularly rewarding for the volunteers, because they get to see the immediate effects of their work. Though volunteering is not all about glory or recognition, being thanked by someone else induces a very unique feeling. It’s not uncommon to receive a barrage of compliments and recognition for the hard work. The PAVA organization is represented as a club in our school, having the same name as the organization. Including students of various class levels- from 8th graders to juniors- the school club is the perfect place to begin the process of making a difference in the community and environment.